In Edmonton we will meet Kinsmen Sports Centre (at the cafeteria) at 4 p.m. If you are driving, park close to 105 St.
We go east on the city trails. 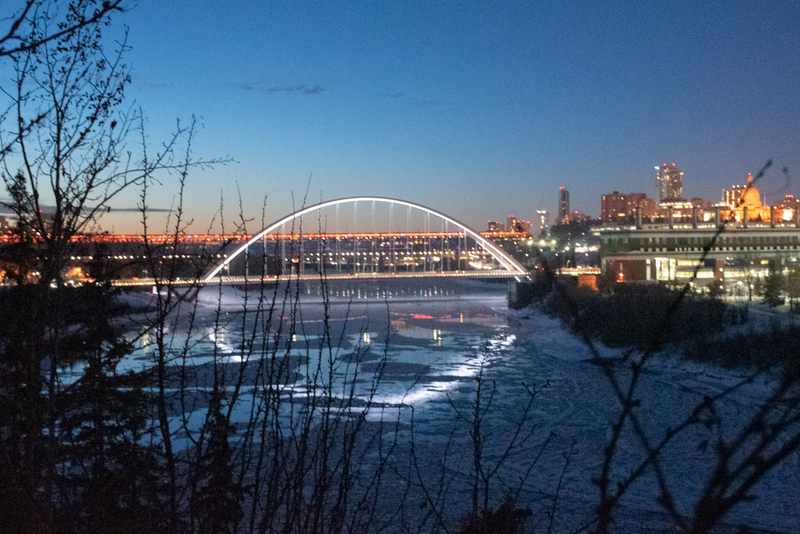 It will just be getting dark, so we’ll have a fine view of the city skyline across the river, and the new 105th St Bridge plus the High Level Bridge all lit up (see photos). After crossing the Low Level (99th St) Bridge we go west through Irene Parlby Park and the newly-opened trails that pass under the 105th St bridge, plus a new footbridge! At the Royal Glenora Club we climb out of the river valley and head to the Legislature for a warm up and the free Christmas concert. The music ends at 7:30 p.m. so we head back across the High Level bridge. Those who want to come for pizza/gelato/coffee will continue to Rosso (between the bridge and the Garneau theatre). Those who don’t want to eat will just head down the hill back to the Kinsmen parking lot. If you would like to come for dinner but you don’t want to hike, let me know by replying to this email or text JoAnne (780-232-0733) and I will add you to the 8 p.m. reservation. Note: this will be a Sunday evening hike to take advantage of the “Celebrate the Season” events at the Alberta Legislature ! If you are new to WTA hikes, then you should visit the Guided Hikes webpage for essential information. For further information specific to this hike, refer to The Waskahegan Trail Guide Book (pages 10-11) or contact the Hike Leader, or contact the Hike Leader, JoAnne B & Lee S..